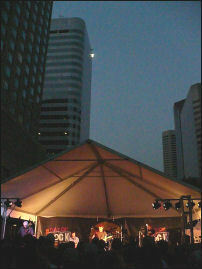 Toad the Wet Sprocket played on the Arapahoe Skyline 2 Stage on the 16th Street Mall in Denver. The event was The Day of Rock, Concerts For Kids. This was the third year for the event held on Memorial Day weekend. After recording The Samples set at the Welton Street Stage I headed over to the Arapahoe Skyline 2 stage to see Alicia Witt and check out the stage Toad would be playing on later in the day. I found a great spot to set-up my microphone stand for recording. So, I decided to just stay there until Toad the Wet Sprocket came on. That turned out to be a good choice, because when it started getting crowded there really was no other spot to set up a microphone stand out of the way of the crowd. Toad got a short introduction and then went right into playing "Something's Always Wrong" from the "Dulcinea" album. The sound coming from the stage and PA system didn't sound clean to me when Toad started. It was a bit muffled and was very heavy in the lower mid-range frequencies. After listening back to my recording I hear multi-instrumentalist Jonathan Kingham filling out the sound. But, he was a little too high in the mix on some songs, which added to the mid-range muddiness I heard throughout the night. Though, I did appreciate his instrumental contribution on all of the songs. "Whatever I Fear" was next, followed by "Jam" from the "Pale" album. The set got kicked into the next gear with "Crowing," from Toad's best album "Dulcinea." "Crowing" didn't quite have the edge it does on the album, but it was a good reading of the song. The sing along "Good Intentions" and another four songs from "Dulcinea," "Stupid," "Nanci," "Inside" & "Windmills" were next. Hearing Todd Nichols sing "Inside" made me wonder why he doesn't sing more of the songs. His voice is so clean and pure. Hearing Todd sing lead so powerfully was the highlight of the show for me. During "Windmills" I could hear some sound bleeding over from the main stage where Toto was playing. But, it wasn't as loud as all the people that were talking in the bar tent I was standing next to. Glen Phillips announced they were going to play a new song. So, they played "The Moment" and "Friendly Fire," two songs I hadn't heard them play before. I liked them both and I think they fit in nicely with the older, more well known songs. Glen told the crowd that they were working on getting a new Toad the Wet Sprocket album out before the end of the year. The crowd was happy to hear that. I was glad to hear that too, as I'd like to see them play live again to support that album. I had not seen Toad the Wet Sprocket play live until this show. A funny thing is that they played in Colorado Springs at the Black Sheep, a few miles away from my home, in 2011 when I was in Kansas visiting my family. So, I was determined to make sure I saw them when they came through Colorado this year. I'm glad I did. The next song, "Come Back Down" brought the set back into familiar territory. Jonathan Kingham played mandolin which sounded very good on the song. Before "Nightingale Song," Glenn introduced bass player Dean Dinning. We were told to clap on the off beat as Dean played the tambourine. The crowd participated for a little while, but didn't follow through on the whole song. It was great to hear "All I Want" from the "Fear" album next. It was during this song that I started to really appreciate the band's low key stage demeanor. Glenn didn't introduced many of the songs before the band played them. This allowed the music speak for itself. Todd sang one of the band's radio hits "Crazy Life" next. Again, I appreciated hearing his voice. I hope he gets to sing lead on something on the new album. A false start on "Brother" proved that the band is human. So, they launched into "Finally Fading" before they played "Brother" for real. This song was another radio hit for Toad. During this version there was an organ solo that was too high in the mix, which marred an otherwise good played version of the song. "Fall Down," again from "Dulcinea," ended the set with the crowd wanting more. The encore was three songs, "Come Down," "Ziggy Stardust" and "Walk On the Ocean." The David Bowie penned "Ziggy Stardust" was a pleasant surprise. I didn't anticipate hearing Toad play a cover song. I thought it sounded good and worked really well in the encore. "Walk on the Ocean" was the show closer and sent everyone out into the night on a high note. It was so cool that the band came out and talked to people and signed CD's after the show. We saw every band member but drummer Randy Guss in the crowd after the show. It was great fun. 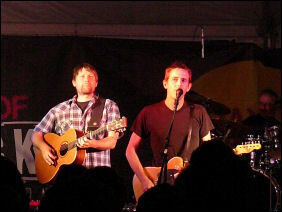 I hope to see Road the Wet Sprocket again if they tour to support the new album they are working on. © time between the notes... 2012-2014 All rights reserved.